Try the perfect entrée with this garlic and onion chicken. 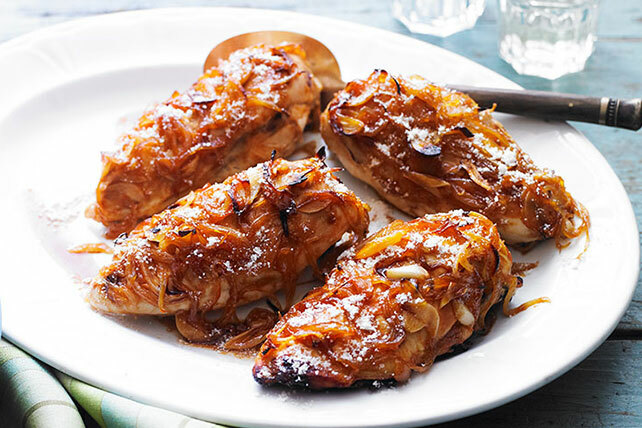 Caramelize Garlic & Onion Chicken has a tangy sauce that's delectable in every bite. Melt butter in large skillet on medium heat. Add onions; cover. Cook 9 min. or until onions are tender, uncovering after 3 min. and stirring frequently. Stir in garlic; cook 8 to 10 min. or until onions are golden brown, stirring occasionally. Stir in 3 Tbsp. steak sauce and sugar; cook and stir 2 min. Place chicken in shallow baking dish. Mix remaining steak sauce and mustard; spread over chicken. Top with onions. Bake 30 min. or until chicken is done (165ºF). Serve topped with cheese and sauce from bottom of dish. Serve with smart sides, such as a baked potato and your favorite steamed vegetable. Tent chicken with foil if onion mixture becomes too brown before the chicken is done.